Above Ground Pool Problems and Treatment Options. Solving Problems and Making Better Choices. Caring for above ground pools. A pool requires proper care, in order to preserve its appearance and extend its life. Water testing helps avoid conditions that might damage the pool equipment or make sanitizing less effective. A ColorQ all-digital tester can measure all the common test factors. There is a model, for every sanitizing need. Salt chlorine generators are a better way to do chlorine, providing more control and helping avoid algae blooms or poor sanitation. A Solar-Powered, Robotic Pool Skimmer/Cleaner works autonomously, to remove floating leaves and debris, before it settles to the pool floor. A Portable, Hand-Held Vacuum is an easy way to clean a pool. 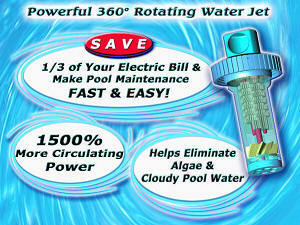 A Solar-Powered Pool Mineralizer helps control algae growth, while reducing the overall chemical usage. Treats pools up to 32,000 gallons. How to care for an above ground pool? Above-Ground Pools are a very popular choice for a variety of reasons. These pools come in a multitude of sizes and shapes to suit the space requirements or budget. Above-ground pools are constructed from a variety of materials. The quality above-ground pools should be expected to provide many years of enjoyment. Make sure to get off on the right track, by making sure that the pool base is level, free of protruding objects and follows the manufacturer's recommendations. Use quality sand, vermiculite or a pool pad, for best results. The quality constructed above ground pool are frequently equipped with the same of filtration and sanitation systems, as inground pools, and should be able to provide ideal water quality. However, the least expensive types of above ground pools can expect to experience difficulties in filtration, vacuuming and maintaining proper pool chemistry. If problems arise, refer to the Pool Problems Page, as a source of problem-solving information, broken down into various categories. Scroll down the page and click on the linked keywords, catch phrases or images, in the archived answers below, to access additional information, on that topic or product. ► How Many Gallons In My Pool? The pool, we just ordered is a 21' round, above ground pool. To make sure that we properly approach the pool water chemistry, we want to be certain of the water capacity. Thank you. You are better off with the correct water volume, as it should help with the chemical balancing. You failed to include the depth, so you will have to do some simple calculations. Go to this page: Calculating Pool Volume. You'll find the simple calculations for determining the water volume of any type of swimming pool. This is our first year of pool ownership. The pool is an 18' round, above ground pool. We seem to have developed some algae on one side of the pool. I use a chlorine floating feeder, with 3" tablets and have been very careful about the pH, alkalinity and stabilizer. I clean the cartridge filter weekly and run it for 8 hours a day. What went wrong? Please help because I won't let the kids in the water. You have the most common type of swimming pool algae problem. It does sound like you are taking good care of the pool. Still, bad things can happen to good pools! This is really not that bad a problem - just an inconvenience. Algae is always present in swimming pool water. If the conditions are right, it will begin to grow. That means, if the chlorine level has bottomed out because there wasn't enough in the water or the demands of the bathers was just too high, algae can start to grow. From your letter, I cannot determine the actual cause, but I can make an educated, insightful guess. The chlorine floater may not always be able to supply all the chlorine that the pool requires, because the tablets are slow dissolving. Floaters are popular with above ground pools, but are not necessarily the best way to add chlorine. It may be necessary to supplement the chlorine floater, by the addition of a quick dissolving product: sodium dichlor, liquid chlorine, lithium hypochlorite, non-chlorine, shock, etc. This can be used to give the chlorine a quick boost, during those periods of high bather usage: like when all the kids are in the water for hours at a time. Test the water for Free Chlorine, several times a day, to gauge the requirements of your pool, during these periods of peak activity. I suggest that you use an algaecide to help prevent the growth of algae. To get rid of the algae, add 2 pounds of shock, per 5000 gallons of water. Circulate continuously. Test the water for Free Chlorine and keep the level at 2-3 PPM or higher, until the algae is gone. Thereafter, resume normal chlorination and filtration. Because the algae formed on one side of the pool, try and direct more water to that area. Adding The Circulator - a circulation booster - will help improve circulation and sanitizing. Swimming can resume, when normal chlorine levels return. If the water is cloudy, this can be due to dead algae and organic debris: adding a "Blue" Clarifier will help improve the water clarity. To help maintain better water clarity, in an ongoing basis, the addition of a Nano-Stick Clarifier, which lasts for 4-6 months, would be a positive addition. ► Endless Swimming In An Above Ground Pool? I have an above ground pool (15' x30' oval) and I would like to be able to swim, without having to turn around. The add-on pump systems, that create a current so you keep swimming straight ahead, seem not practical, from my type of pool or the cost is more than I am prepared to spend. Do you know of a more affordable option? Swimming into a current may sound like a good idea, but it may not be the best way to swim endlessly in place, based on what I have heard. For about $200.00 you can add an aquatic fitness trainer. It utilizes a flexible pole, a tethering line and a belt. Belt it on, wade out and start swimming. Your pool is more than long enough, to make this work. There are several ways to mount the pole: deck mounted, ladder or rail mounted or used with a portable water-filled base. There is even a portable model, to take away with you. It even works with above ground pools, so you pool size is not a factor. This is professional-grade equipment, that is use to training swim professionals and others. The combination of the flexible pole and the tether will really make you feel like you are swimming endlessly. This product should be just what you are looking for. ► What To Do About Using Well Water? I am going to be filling a new 12,000 gallon pool, using well water, that I know contains some iron. I am afraid of stains that might result. I don't have a water softener. Any good suggestions? Thank you. It does pay to plan ahead, in your situation, to try to avoid common Pool Well Water Problems. If you add the well water throug h a METALTRAP Filter, the heavy metals will be permanently removed. When the pool needs to be topped off, pass all the water through the METALTRAP Filter. Removing metals, as the pool fills is the best insurance against future problems. Remember, always use the METALTRAP Filter to treat all new water! There are chemicals means to treat metal problems and/or remove the stains they cause. Not all of these chemicals are equally effective, some are ineffective at higher pH levels (over 7.8) and others contain phosphates, which can lead to other problems. Liquid METALTRAP is phosphate free and works over the full pool pH range and beyond. Adding this chemical can help avoid staining and/or discoloration. Good luck and I hope that I've been helpful. ► Vacuuming A Splasher Pool? I have an above ground pool that is a 10' diameter round and is 2.5" deep. I guess this is considered a splasher pool. It has a filter pump system that filters the water and is chlorinated and I have been able to keep the chemicals right for over a month now. The problem we have is I need a good vacuum for it. We live in West Texas and our dirt is smaller than sand and the vacuum that I have (one that uses the garden hose and a filter bag) doesn't work. Do you recommend an automatic cleaner/vacuum? How do I get the dirt off the bottom of the pool? The type of vacuum and bag, that you are using, is intended to remove coarse debris and not fine particulates. Try using finer material as a collection bag. Another option would be to disconnect the intake line, seal off the opening in the wall and attach the intake hose to a vacuum head and pole. This way the dirt can be removed by the filter. To do this you may need some adaptors and an extension hose. It may take some tinkering, but should work. A better option, for small pools, would be a rechargeable, hand-held vacuum or battery-powered Leaf Vacuum. They have a self-contained filter and the smaller models are frequently used with spas and hot tubs. I hope that I have been helpful. Good luck. ► Testing The Pool Water? We just bought our first pool - a 12' x 24' above ground model. It is being installed next week. Can you suggest a good source of chemical start up information? How about a pool water tester? I have seen those color-matching ones and would like something else. Thanks for any help, you can offer. Welcome to the world of backyard swimming. You will find information on maintaining the important pool water parameters on the website page: Calculating Chemical Additions. If you want to eliminate the color-matching and avoid the guesswork, the ColorQ all-digital water analyzer is what you're looking for. It is easy-to-use and will do all the tests you need. I hope that this information proves helpful. Enjoy the pool. ► Inflatable Pool Air Leaks? I have one of those pools with an inflatable top ring. Seems to have a leak and I am slowly losing air. Any suggestions about locating the leak and fixing it? I appreciate your time and effort. Look for signs of bubbling, where the ring is covered with water. That will indicate the location. If you don't see bubbling, the le ak is above the water level. Get some swimming pool algaecide that contains dimethyl ammonium chloride. Make a solution of one part algaecide and 3 parts water and stir it up with a 1-2" brush so that it lathers a bit. They use a technique like this to find a leak in a tire. You don't want to use soap, because you don't want it to end up in the pool water. Brush it on the seams and other areas, until you find the leak. Once found, clean the area with rubbing alcohol and allow to dry off. With this type of thin walled pool, you cannot use a traditional vinyl adhesive and patch, as this can damage the vinyl. Boxer Adhesives offers a complete line of vinyl repair products, including an adhesive patch that is intended to be used with pools just like yours. If necessary, it can even be used under water! I hope that this information will prove helpful. ► Pool Liner Replacement Type? We bought our house last year and the above ground pool has been a problem since then. After spending the entire summer and too much money messing with the chemical composition in the pool & learning how to change the sand in the filter, we thought we were done all of our pool challenges, then came the holes in the liner, (3) of them. So here is my question, I am replacing the liner because I made the mistake of draining the pool and leaving it empty for a few months. I know this was bad. I am now looking at buying the new liner, I have a j- hook liner now, but in looking at pricing, it seems that overlap liners are much cheaper. Do you know if I can buy an overlap liner and use on my j-hook channel? Also do you have any recommendations for what chemicals I need to add after it is filled? I live in Houston and for some reason last year, I just could not keep chlorine in the pool. We have very hard water so I am hoping that this will help in keeping the chlorine in there, but what else should I add? I was spending around $100.00 a month in chlorine, is this normal? Thanks so much for any help you can offer. A pool that utilizes an overlap liner, has a top rail that covers the vinyl. With a hung liner, such as you have, the liner stops below the rail. You can't simply use an overlapping liner in a pool that requires a beaded liner. My guess is that you won't be able to use that type of liner, but check on the type of rail to be certain. A $100.00 a month for chlorine is way too high! The question to be asked, is where is all the chlorine going? Are there kids that are urinating in the pool? Is the whole neighborhood using the pool? Is there algae growing and causing the requirement for lots of chlorine? Bad water chemistry? There has to be an answer. Your requirements should be far less that that. Upon refilling, I suggest that you start with a clean slate. Adjust the water chemistry, pH, TA and stabilizer, and keep tabs on the pool usage and free chlorine readings. The answer is somewhere. One of the limitations of chlorine is controllability. If you are using a granular product, the level will rise and fall, based on product addition. If you are using a feeder, it is not a simple matter to get more chlorine quickly, as it is supposed to be slow-dissolving. 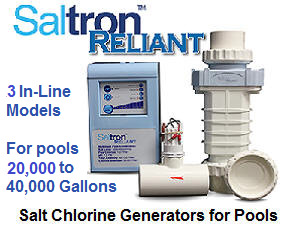 A salt chlorine generator would help solve the cost of chlorine problem, after the initial investment. In addition, it should prolong the life of the liner and give you better water quality. Your sand filter may not be providing the necessary level of filter effectiveness. You might consider replacing the sand with a zeolite, which is a sand filter replacement media. It will provide better water quality and is quite modest in price. In any event, don't backwash the sand filter unless the pressure is too high, as frequent backwashing is a mistake. I hope that this year turns out better. 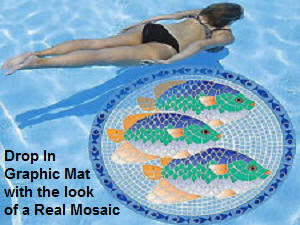 Use a Premium Pool Graphics Mat to decorate your pool floor. The image appears to be tiled on your pool floor, but that's just an illusion. Actually, you simply set one of these colorful graphics on the water and push it to the bottom, with a pool brush. Its weight keeps it there. Choose from 9 attractive designs, plus a custom monogram model. Most are available in 3 sizes: 47" diameter, 23" diameter or 10.5" diameter. No adhesives needed and installation is just that simple. To remove or place elsewhere, just lift it off. Pools that turn amber to rusty, brown or blackish, after addition of chlorine or pH raising chemicals, usually have iron and other heavy metals present. This is especially true, when well water is used. Whatever you added was not enough. If you had filtered the well wat er, used to fill the pool, through a METALTRAP Filter, the heavy metals would have been permanently removed. When the pool needed to be topped off, all the new well water could have been passed through the METALTRAP Filter, to prevent new additions of metals. Removing metals, as the pool fills is the best insurance against future problems. There are chemicals means to treat metal problems and/or remove the stains they cause. Not all of these chemicals are equally effective, some are ineffective at higher pH levels and others contain phosphates, which can lead to other problems. Liquid METALTRAP is phosphate free and works over the full pool pH range and beyond. Adding this chemical can help avoid staining and/or discoloration. 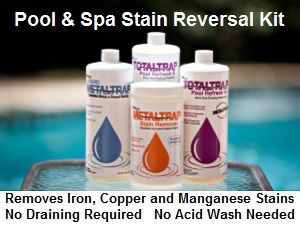 If staining has occurred, it can be removed with METALTRAP Stain Remover. This 100% ascorbic acid products helps to reduce and solubilize heavy metals, so that Liquid METALTRAP can keep them in solution in a chelated state, which is less colored and more stable. Following up with a recirculating treatment, using the METALTRAP Filter can permanently eliminate the metals. All you need is a garden hose and a small pump to do the recirculation. Good luck and I hope that I've been helpful. You have a filter that is barely effective. When the kids use the pool, they stir up silt that has accumulated on the bottom. The filter can remove only what enters the system. By adding The Circulator, a circulation boosting accessory, you can get more of the silt removed and the water will steadily improve. The Circulator was originally designed for inground and standard above ground pools. However, now there is an adaptor that allows it to be used with soft-sided pools, from the leading manufacturer. Adding a weekly dose of a Blue Clarifier, should help, as well. I have been told that The Circulator can make a huge improvement in water quality, in pools like yours, in particular. I hope that this information will prove helpful. ► Losing The Minerals Battle? We have a vinyl pool that holds about 6000 gallons. We filled it with well water and we use a paper filter system. We filled it and we were fighting hardness. We got that under control. Recently, we have been fighting very cloudy water that settles down overnight and then I vacuum the pool floor in the morning. The floor looks very dirty and you can see where you walk, and where you vacuum I clean until the cloudiness is so bad I can't see to clean anymore. When I rinse the filter out it washes out sort of green/brown. I keep my pH about 7.6-7.8, although it does want to be a little high sometimes. My chlorine is also checked daily and added accordingly. Alkalinity is about 90. Please help if you can. You have a filter that is inherently inefficient. To make matters worse, you are using well water. This sediment is probably passin g right through the filter. There are accessories that you can attach to the return line and could help remove the silt and sediment, that is passing through the filter. This improvement, in the removal of fine particles, and the maintaining of proper chemistry should make a big difference. Better filtration is only part of the solution. Well water can contain metals and minerals of all sorts. Using the METALTRAP FILTER or the MetalTrap 1-micron PRE-FILTER can make a huge difference. Even better would be the METALTRAP Dual-Cartridge Filter, with replaceable cartridges it removes fine sediments and dissolved heavy metals. These products attach to a garden hose and remove the problem-causing metals, before they get into the pool. If you simply recirculate the water using a garden hose and a small submersible pump, you can slowly remove the metals from the pool water. This is better than adding chemicals, which sometimes break down and allow a return of the problem. Nothing beats removing the source of the problem! I hope that this information will be helpful. There is nothing that will colorize the area, that I know of. However, you should be able to cover it over with a Premium Pool Graphic Mat. They are available in various sizes and designs. For example you could use a Dolphin or Turtle design and it would look like it was part of the pool. In the future, if you get a stain, try using METALTRAP Stain Remover and Liquid METALTRAP. I know that combination would have removed the stain, without any scrubbing. Unfortunately, vinyl liner designs are only printed on and cannot withstand harsh scrubbing. I hope that this information will be helpful. If you don't install an above ground pool on level ground, you will be putting extra stress on some of the vertical supports and that may impact your warranty. In addition, the water level will not be on the level! I suggest that you consider the following. Make a square frame of 12' lengths of pressure treated 2" X 6" lumber. Add sand or pool base and level it out. Place the pool on top of the level base and fill it up. Afterwards, top off the exposed sand with gravel, marble chips or wood chips. If you place the liner directly on the concrete you will probably wear a hole in it. I hope that it works out for you. Enjoy the pool. ► Benefits Of A Main Drain? I bought an above ground pool and the installer suggests a center drain. What are the advantages or disadvantages to a center drain. Thanks for your time in this matter. Main drains are not common, with above ground pools. They can be prone to leaks and can freeze, if not winterized properly. On the plus side, they do help improve circulation and help remove sediment. However, there is a simple, affordable way to improve circulation, enhance filtration and eliminate the dead spots that favor algae growth. The Circulator is a device that fits into each return jets and greatly improves circulation, heat distribution and chemical dispersing. Good luck with the new pool and I hope that I have been helpful. ► Algaecide: To Use Or Not To Use? I have never used an algaecide in my new above ground pool and have had no problems to date. My friends with pools, all seem to use algaecides and chlorine. Is it a good idea to use algaecide? Just wondering. The best way to use an algaecide is to add it before you have a problem! That way, it can help you avoid a problem. Chlorine levels rise and fall during the course of the day, depending upon chemical additions and bather usage. When the sanitizer levels drops too low, algae can begin to grow. If an algaecide is present, it just might keep the algae under control, until an adequate sanitizer level is restored. Both above ground and inground pools should use algaecides. However, the choices may differ because of the materials of construction. I hope that I have been of assistance. ► Should I Empty The Pool Periodically? I have a above ground vinyl pool 13,600 gallons, with a sand filter. Someone told me I needed to completely drain my pool every couple of years. Is this true? I keep it well maintained and hardly ever have a problem. Nothing but a little cloudy water every now and then. Usually use a clarifier and it clears right up. Should pool water be completely changed every couple of years? Any help would be appreciated, Thanks so much! You do not have to empty your pool. During the normal course of the season, you will pump water out to backwash a filter or vacuum to waste. At season's end you could pump out a third of the pool, as part of winterizing. Between backwashing and lowering to pool to winterize, you are doing partial water replacements, every season. Because of this, there is no special need to replace the water every few years. However, if the cyanuric level rises too high, it might be advisable to replace some of the water. Even under these circumstances, it is safer and better to replace a foot of water each week, until the level is appropriately reduced. You will get better results, from your sand filter, if you switch to a zeolite sand replacement. I hope that I have been helpful. Enjoy the season.